Knock it Off is such a fun concept! Especially since most things are either far out of my price range, not in the right size, or, in this case, sold out. But why buy something when you can make it? 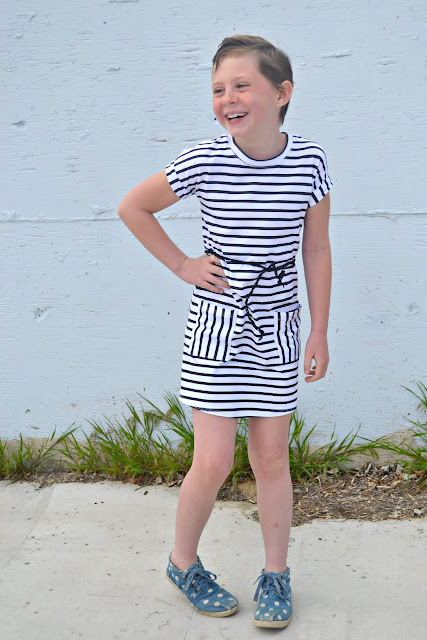 For today's post I chose to go with this girls striped dress from Forever 21. Probably affordable, but it was sold out when I saw the pin on pinterest, so why not knock it off? I adore stripes and I love t-shirt dresses. Not for me. I should wear dresses more, but that's a fear I must conquer another day! I chose to make it for Zoe because Aevs has been getting quite a lot of attention this year. I used Sew Much Ado's Skipper Top that I hacked into a dress. 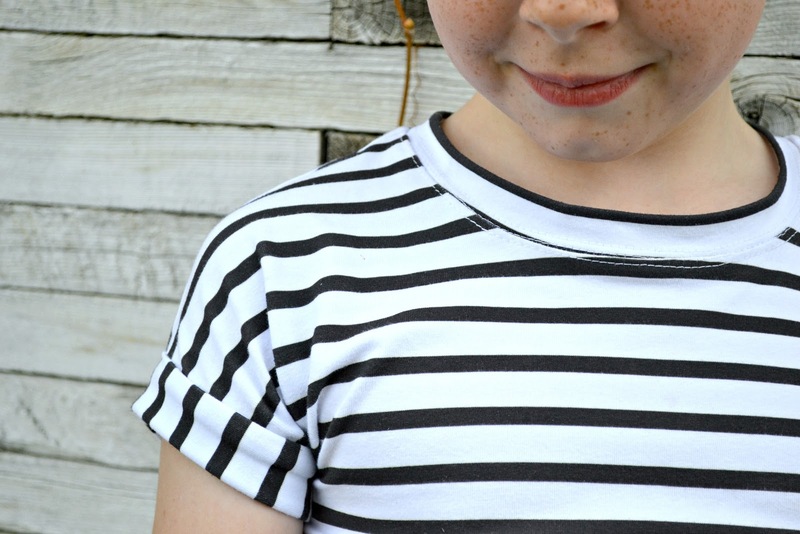 I know I differed from the inspiration on the sleeves and neckband, but I was slightly lazy as well as I love stripes and only bought a bolt, so I wasn't wasting 2" more to make a faux button placket on that shoulder! I take my stripes seriously here. The neckband also took less fabric then a facing, so that was that! 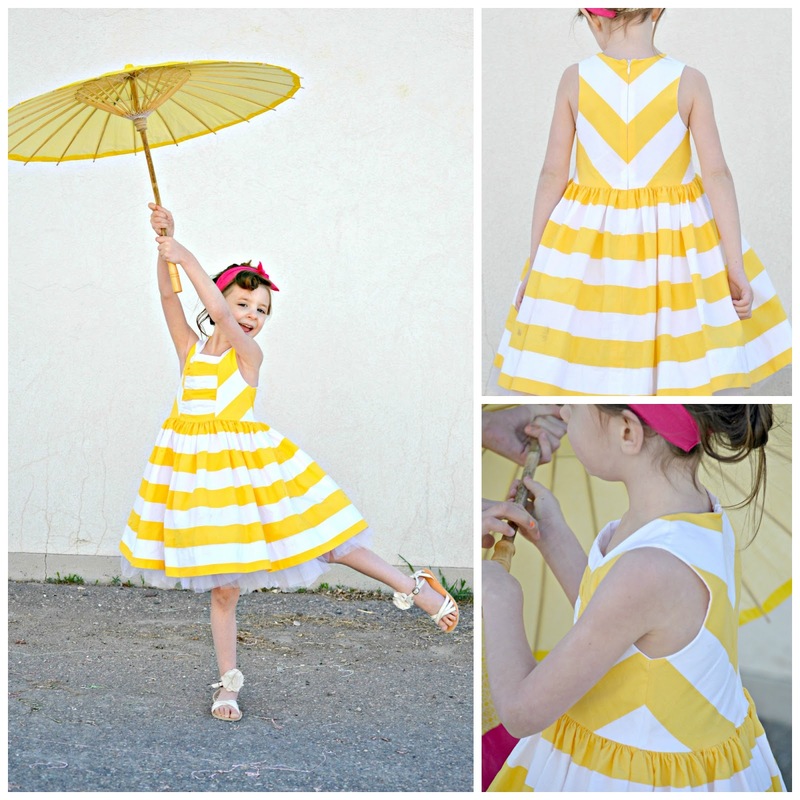 The stripes are from Raspberry Creek Fabrics. I wasn't joking when I said I bought a bolt. 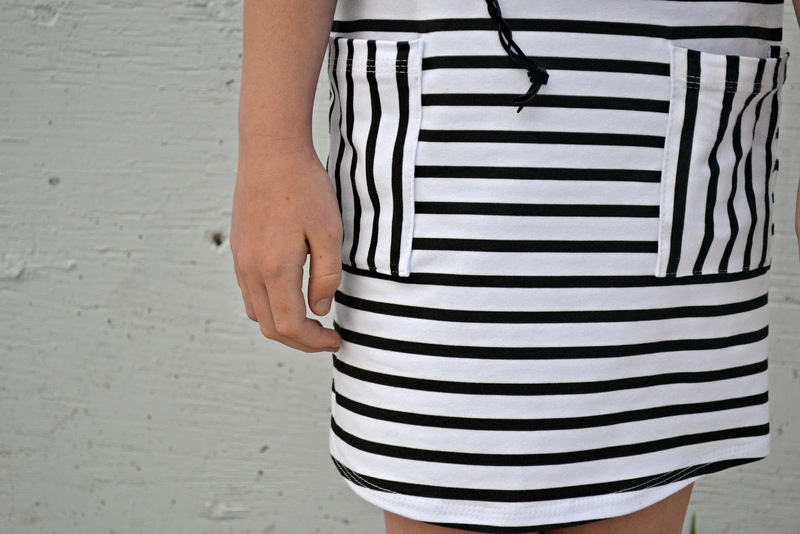 If I could only sew with one print the rest of my life, it would be black and white stripe. Hands down. I made the belt out of some black leather cording that I bought at Joanns and have had in my stash for a ridiculous amount of time. We accessorized with a Mint Julep Bitty bow from Stitch & Pink. 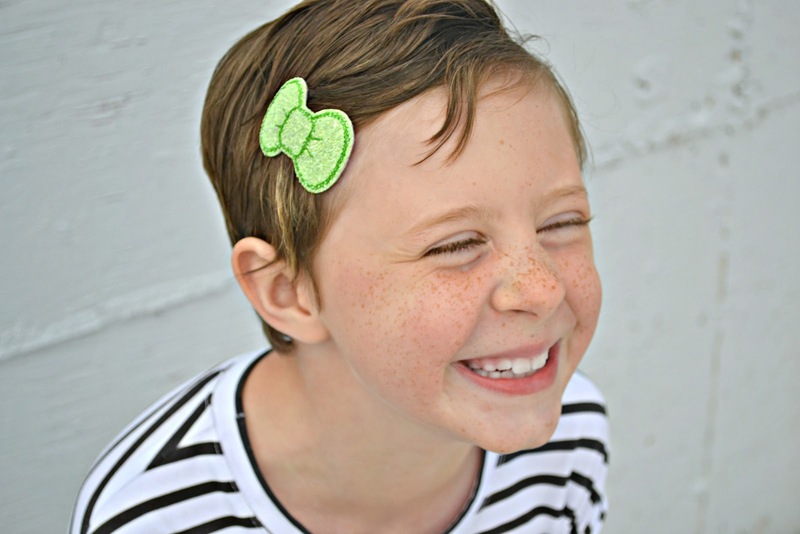 This girl is loving her short, short hair and as of now, "never wants to grow it out". So we had to order quite a few since they're so cute! 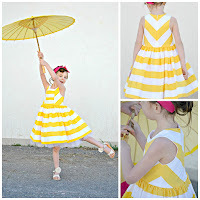 This dress (also found on pinterest) was my inspiration for my Lemon Zest dress that I made for STYLO a couple years back and one of my favorite "Knock Offs" I've made! 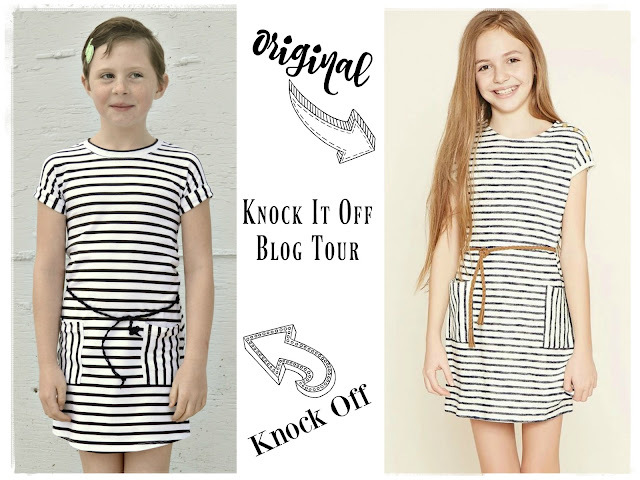 Don't forget to check out the other Knock It Off items! I love it! 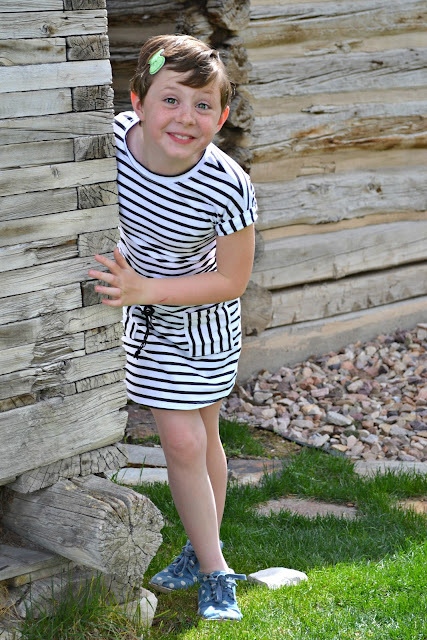 I love black and white stripes and t-shirt dresses. But I'm the same and have a fear of dresses on me too! ha :) Thank you for being on the tour! Both of these are PERFECT knockoffs! Love the black and white stripes, and it is totally your style. Honestly, I was expecting it to be Riley Blake so I was surprised when I read it was RCF... But you did buy quite a lot of that too I remember. The little clips are a nice added pop of color. 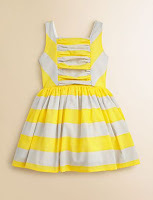 The yellow dress is fabulous as well! Such a great one to pull out and remind people of. 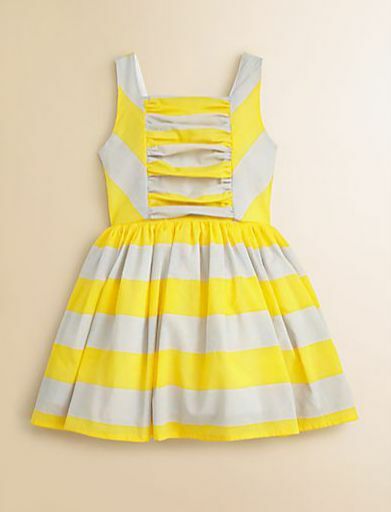 Your dress is totally cute. What I like about knocking off is that you get the look and can make the tweaks to make it how you like it better. You completely nailed this one! It is so perfect! I kind of like your neckline more than the original design. My daughter is so picky about things around her neck so I usually opt for a band whenever possible! Love this!! !